More Cricut products arrived today! Look what my fantabulous UPS guy brought!.. Cricut 101 last night was great! We had 8 ladies at the Cricut 101, with all three types of machines represented. Everyone learned something and had fun! 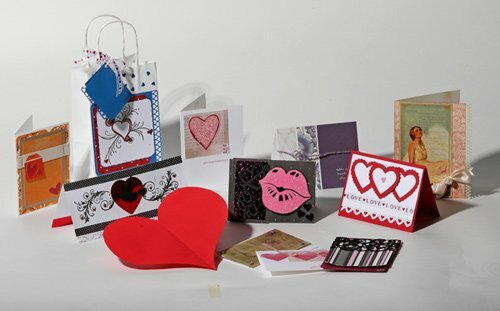 Valentine cards for the kids to make this Friday! 3 sessions @ $10 per child per session. They can make as many cards as they like. We'll provide the supplies and the materials. Charleston Scrapbooking cards featured in the Post and Courier today! Pick up a copy and check it out :) Many of our cards are made using the Cricut. Come to the Swarm on Saturday 2/12 from 8:30am - 5:30pm and chat with the designers. The Mom has been a bit pre-occupied with the crop room remodeling, planning the big upcoming events, and shopping for new product. We've had several spur of the moment girl times at the store and have been making lots of cuts with the Imagine and the Expression. Ramon, Nicole and I were all cutting at the same time last Saturday, so I pulled out the Create. I love the convenience of the small size and extra functions. I have lots of new cartridges and have added a few twists to my classes. Come join in on the fun and education. Cricut Swarm Saturday 2/12 9:30am-5:30pm NO FEE!!! We have the Cricut Tool kits in stock and.. Check out the QuickStick for ease in placing those tiny die cut pieces.